As more bodies were pulled Wednesday from a mountain of jagged concrete and twisted steel left by a highway bridge collapse that killed 38, prosecutors focused on possible design flaws and past maintenance of the heavily used span, and politicians squabbled over blame. Motorists, meanwhile, recounted miraculous escapes and the horror of seeing others plunge over the edge. As a second night descended on the site where part of the Morandi Bridge plunged some 45 meters (150 feet), Interior Minister Matteo Salvini declined to say how many people might still be buried in the debris where about 1,000 rescue workers searched for victims. The Genoa prefecture had earlier reported 39 people had died, but revised that number to 38 early Thursday. The collapse occurred about midday Tuesday, the eve of Italy's biggest summer holiday, when traffic was particularly busy on the 51-year-old span that links two highways — one leading to France, the other to Milan — from this northwestern port city. Salvini declined to say how many people are still missing, and he added that trying to locate them was particularly difficult, due to the holiday. "It's not easy to distinguish between who doesn't respond because they are on the other side of the world and turned off their phone to relax" on vacation, and "who's not responding because they are under the rubble," he said. He said he hoped the death toll would not rise. "Miracles are still possible," Salvini said. Authorities urged the quick removal of tons of debris from a dry river bed so that the rubble doesn't create a makeshift dam if heavy rains fall in the flood-prone city on the Mediterranean. Debris also must be cleared from railroad tracks, a vital link especially now that Genoa is largely cut in half by the loss of such a key artery, Premier Giuseppe Conte said. Authorities worried about the stability of remaining large sections of the bridge, prompting a wider evacuation order and forcing about 630 people from nearby apartments, some practically in the shadow of the elevated highway. Firefighters went inside some of the vacated apartments briefly to retrieve documents and, in at least one home, pet cats. 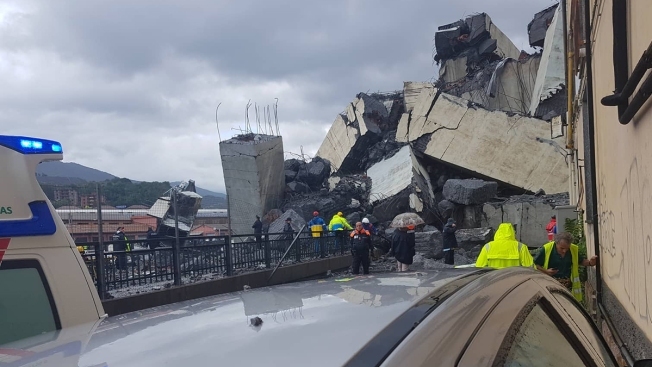 Building a new bridge could require razing the evacuated buildings, said Transportation and Infrastructure Minister Danilo Toninelli. After leading an emergency Cabinet meeting in Genoa, Conte said there were 39 confirmed dead and 16 injured, including nine in serious condition. Three children were among those killed, Salvini said. The dead included four French citizens traveling to a music festival and two Albanians. 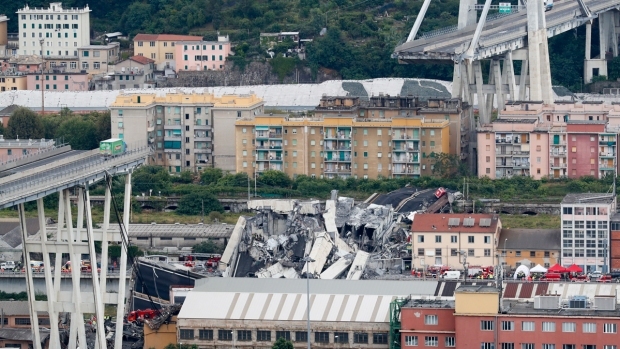 Genoa Prosecutor Francesco Cozzi told reporters the investigation into the collapse was focused on human causes, specifically any possible design flaws in the bridge's construction or any inadequate maintenance. He said he didn't know who might be responsible, but added: "It wasn't an accident." Asked if authorities had any warning that the bridge could be dangerous, Cozzi indicated that no serious safety concerns had reached his office before the collapse. Otherwise, "none of us would have driven over that highway 20 times a month, as we do," he said. A 20 million-euro ($22.7 million) project to upgrade the bridge's safety had already been approved, with public bids to be submitted by September. According to business daily Il Sole, improvement work would have involved two weight-bearing columns that support the bridge — including one that collapsed Tuesday. The bridge, considered innovative when it opened in 1967 for its use of concrete around its cables, was long due for an upgrade, especially since it was more heavily trafficked than its designers had envisioned. One expert, Antonio Brencich at the University of Genoa, had previously called the bridge "a failure of engineering." Other engineers, noting its age, said corrosion and decades of wear-and-tear from weather also could have been factors in the collapse. Italian politicians pointed fingers at possible culprits. Conte said the government wouldn't wait until the investigation was completed to revoke the concession of a private company, Autostrade Per L'Italia, that operates many of the nation's toll highways. The next company would be held to "more stringent" rules for maintenance. Residents near the bridge told RAI state TV they would hear maintenance work being done almost nightly. Deputy Premier Luigi Di Maio, of the anti-business 5-Star Movement, alleged Autostraade's holding company took profits "instead of investing money for maintenance." Toninelli, the transportation and infrastructure minister and another populist 5-Star leader, said his ministry had started procedures so Autostrade could be fined up to 150 million euros ($170 million). Still-dazed and shaken survivors recounted their close brush with death when the collapse of the 80-meter (260-foot) section of the span sent more than 30 cars and three trucks tumbling. A French lawyer who was in a car with her husband and 3-year-old son said they were just coming onto the bridge when "we saw the pylon go completely to the right, and we realized what was happening." The woman, who was identified only as Leonine, told broadcaster Francetvinfo that they tried to make a U-turn but were blocked by traffic. "We saw a man running and making a sign to everyone to leave," she said. "We opened our doors, took our son out of his car seat," and then ran to a nearby tunnel. One of the widely circulated images of the disaster was a green truck poised on the edge of the span. A truck driver identified only as Idris who was behind that vehicle said it was saved only because of a motorist who tried to pass it moments earlier. The driver of the green truck apparently had to hit his brakes because of the passing car and was able to stop in time, he added. "That truck driver is the luckiest in the world," Idris told Sky TG24. "He should have fallen in. ... He braked right where the bridge was broken." The passing car plunged into the chasm, he added. Idris also credited police for hustling 150-200 people off the bridge to the tunnel, then risking their own lives by going back onto the span to bring some of the vehicles to safety.